Think ‘Athletic Training’ and the first thing that comes to mind for most is the training aspect of the phrase – a workout at the YMCA, a quick trip to the weight room, or a nice jog outside. What many don’t understand is the science behind training, movement, and an overall synchronicity of the body that fuels proper training and balance. There’s much more to it than most know. That’s where fascia comes in. Think of fascia as the most sensitive, highly interconnected system in the entire body it’s the life force next to blood. Without fascia, toned and structured muscle would turn to hamburger meat, organs would spread like wildfire and bones would crumble, as fascia is the single element that organizes and suspends these parts of the body. It’s the most highly innervated tissue, sensitive to every hormone in your system, recoiling with every bump and bruise sustained. Understood scientifically as the system of connective tissue that lay just under the surface of our skin, fascia has the important job of attaching, stabilizing, enclosing and separating every part of our body – applying tension and compression to whatever it surrounds. This is what you feel as a stretch or when you have physical pain. These fascial connections connect with the muscle fascia that affects your movement. Your breath, exercise and sitting posture will all affect the health of organs, as they’re connected facially to the muscles being used for daily activities. 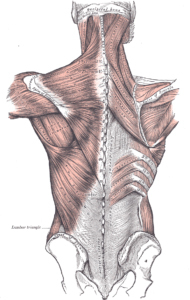 Fascia is sensitive to all movement. There’s no such thing as isolation exercises or having a “leg-day workout” all movement affects the entire body because of the links to the body-wide fascial network. Working at your desk with hands pulled forward on the keyboard pulls the fascia in the low back and hips, and if you cross your legs, your knees and bladder. Knowing this also lends to the understanding that fascia and muscles in one part of your body are directly or indirectly connected to all other parts of the body. Therefore, an imbalance in one area, muscle, or organ has the potential to manifest itself into physical pain in a completely different location solely based on this network of connectivity. Joint health, injury-free sports, organ health and fluid movement are all dependent upon a healthy integrated fascial system. This promotes the notion that you need to take care of every part of your body in the same manner without neglecting any one part. Total body health translates to total internal health and pain-free living. When you come in for a session with Wolfie, this is exactly what he works to address. Weiler Academy Athletic Training and Balance sessions work to keep fascia from tightening and pulling on your body because we know the fascial connections and how they affect our body by movement and stretching. This is especially crucial for athletes who tend to have higher levels of movement and therefore greater degrees of strain on fascia throughout the body. Wolfie knows how to release and repair when fascial damage is done but more importantly how the fascial net connects the entire body – muscles, organs nerves and how our bone are aligned!